First Man is an intimate portrayal of an American icon. Neil Armstrong's moon walk indelibly secured a place in history. Oscar-winning Director Damien Chazelle (Whiplash, La La Land) breathes life into the legend. First Man is not hero worship, or a grandiose exploration of space. It is a candid, searingly honest look at a stoic man; and the stalwart wife who bravely supported him. First Man opens in 1961 with Neil Armstrong (Ryan Gosling) as a test pilot for NASA. A humble, quiet man, Armstrong was facing difficulty at work and heartbreak at home. He had several high profile crashes that worried his superiors. His beloved two-year-old daughter, Karen, had an inoperable brain tumor. Neil and his wife, Janet (Claire Foy), held their family together during her sickness. Karen's tragic death devastated the Armstrong family. In 1962, Neil was chosen to be an astronaut in Project Gemini. The mission was to successfully rendezvous a manned capsule with an orbiting spacecraft. The Armstrongs jumped at the chance to start anew. But the space race between the Soviet Union and the United States was distinctly in the Communists favor. NASA chartered a bold new mission, Project Apollo; with a goal to land an astronaut on the moon's surface by the decade's end. The astronomical effort was fraught with horrific tragedy and setbacks. During this time, Neil Armstrong had proven to be supremely capable under dire circumstances. He is chosen to command Apollo 11, the lunar mission. Janet is terrified of the risk, but Neil was resolutely driven by the memory of his daughter. Damien Chazelle films First Man from Neil Armstrong's perspective. The result is a starkly claustrophobic vision of space travel. You are jammed in the cockpit as Armstrong struggles as a pilot. The vivid blue hue of earth's ionosphere whirls as Armstrong tries to remain conscious during a tailspin. You feel the suffocating space suit when the astronauts are packed into the capsules like sardines. Chazelle focuses the camera directly on Ryan Gosling's eyes. He wants the audience to keenly understand the skill and precision it took to operate these vehicles. These weren't pleasure rides to marvel at the beauty of space. Only in the epic moon landing does Chazelle pull back and allow for the majesty of the moment to take hold. The climax builds like an emotional tidal wave. It is an extraordinary scene, powerfully moving. Neil Armstrong internalized his feelings. He loved his family dearly, but was emotionally distant after his daughter's passing. The relationship between Neil and Janet is gripping. Ryan Gosling plays Armstrong restrained, his eyes conveying a torrent of feelings. Janet desperately wants to talk about their daughter, but he just can't do it. This detachment was Armstrong's greatest asset as an astronaut. He was unflappable under pressure. Armstrong's personality was perfect for life or death decisions in space, but not consoling his wife. Claire Foy continues to be exceptional. Janet Armstrong was vital to her husband's success. She was exasperated by his inability to share grief, but understood his contribution to the space program. This leeway had limits. Several striking scenes in First Man has Foy demanding to be heard. She did not let NASA or her husband off the hook entirely. Foy moves effortlessly in this character. She truly inhabits every role, and is a perfect counterpart to Ryan Gosling. One aspect of First Man comes up bizarrely short. The score by Justin Hurwitz is too similar to his Oscar winner "City of Stars" from La La Land. The orchestral pieces continually reminded me of that film. Every time the music kicks in, I expected Emma Stone to waltz by in space. Chazelle and Hurwitz may be suffering from groupthink. Chazelle should try a new composer for his next film. First Man is significantly more personal and dramatic than the usual Hollywood space offerings. Don't walk in expecting Apollo 13 or Gravity. First Man is ten years in the life of Neil Armstrong. It's a fascinating character study of a great man. 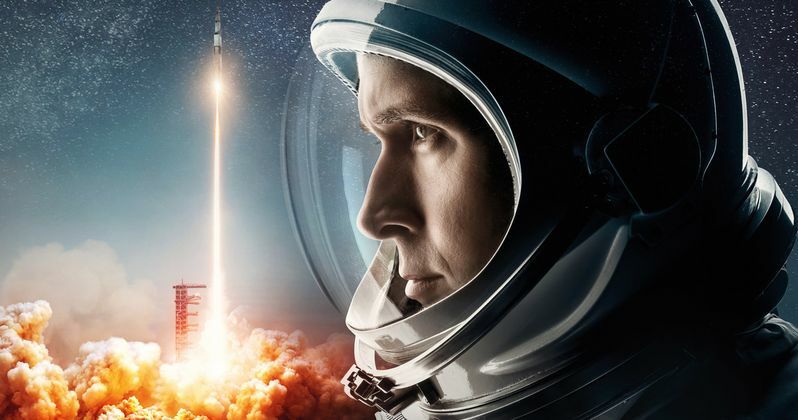 First Man will undoubtedly be an awards favorite for Universal.